I do enjoy making a beautiful salad, with all my ingredients fresh and finely chopped, so that any given bite of salad looks and tastes exactly as salad should — a colorful mix of bright greens and vegetables and fruits — rather than that single pathetic hunk of brownish-tinged iceberg lettuce, that is too obese to accommodate other salad fixings beside it on the fork, that usually passes for salad at most dining establishments, fine or otherwise. Why is it that eating a salad at most restaurants is not like eating salad at all? Due to course chopping, one can rarely get two salad fixings on a fork. First, there’s the big bite of lettuce, then perhaps a tomato wedge, then the thick slice of cucumber or a husky chunk of what-have-you. Sometimes I wonder why these salad-makers bother to mix all their fixings in a bowl! There are, of course, exceptions. Mark’s American Restaurant, located in Houston, is one. It’s an exceptional place for salads and everything else listed on its menu. Last October, I enjoyed the most wonderful luncheon salad full of mandarin oranges and grilled salmon and sunflower seeds and mixed greens with a light citrus dressing that, even now, makes my mouth water to think of it. I eat at Mark’s every time I go through Houston, which unfortunately, is not often. So I feel lucky and grateful that another restaurant, Paseo Grill, located just a few blocks down the road from my house, also serves wonderful salads. Paseo’s salads are so good (and so good for me) that I resolved on New Year’s Eve, to enjoy lunch there once a week, throughout 2015! In case you’re wondering when I became such a salad snob, I don’t mind confessing that it occurred the very instant my physician told me, in so many words, that I needed to eat healthier…. that I needed to eat more vegetables and more salads and a whole lot less carbohydrates! All of which, in turn, led me to search for new salad recipes, the sort that I knew I’d look forward to eating, as much as if I were eating a salad at Paseo or Mark’s. And ta-da, here’s one lovely recipe that I found, that’s fit for a Queen, and fit for salad snobs like moi who need to be more fit, and even fit to be called a Queen of Salads. It’s one I’ve been making since last November, which I adapted from the pages of a recipe appearing in the Sunday newspaper. Who says healthy has to be tasteless? Or New Year’s Resolutions can’t be fun? Not this snob, that’s for fit sure. Mix and toss the salad with the following dressing — I use about a third of the recipe and refrigerate leftover two-thirds of dressing for up to a week. If you prefer, you can easily cut dressing recipe in half. Note: For Main Course, add grilled chicken or shrimp to salad before tossing with dressing. After all the go-go goings defining this long season of Pentecost, I am relishing moments of holy leisure today, the guilt-free sort that arrive on wings of winter chill. It’s no small miracle the difference a few days can make to one’s priorities and state of mind. Why all autumn long, prior to knowing that there was such a thing as an “ARCTIC BLAST” (“AB”), I’ve been cocooned in an Indian Summer insouciance, preparing the garden for future summers rather than getting ready for the certain reality of a winter that — let’s face it — could have happened anytime. I put off decision-making on how best to winterize our fountain — whether to store it or keep it operating with a heater — in favor of reworking and expanding large sections of the garden. Rather than taking time to ensure I had paper tape to protect trees most susceptible to sun scald, I instead focused on editing plant material — adding, and relocating plants within my garden… passing along other plants that needed more spacious digs. So to read how AB ended up catching me off guard could surprise no one… but maybe myself. The day after AB arrived, the fountain was still operating…without its needed heater. Tree trunks of those normally wrapped were still bare. And the most prolific tomato plant I’ve ever been privileged to nurture was loaded with hundreds of little green tomatoes… just waiting for someone to take note… and pick, pick, pick. The gardener shapes the garden and vice versa, but both are shaped by seasonal changes. Take this winter freeze, for instance. Before this, I’d never considered how effective winter can be at making things happen. When a freeze means do or die, it’s time to do. Which in my garden meant that the fountain heater finally got installed. The trees got taped. And a few hours before temperatures dived below thirty-two degrees, my husband and I picked too-many-to-count little green tomatoes, fifty of which have already ripened. Winter makes things happen in other ways, too, though often, in less perceptible ways. In an out of the garden, new growth occurs below the surface of life; as roots develop for spring growth within the cold, dark soil, something analogous goes on in the life of this gardener, too, as I’m snuggled into some warm and light-infused spot of my lovely home. Like no other season of the year, winter invites me to settle in and get still, it offers me creative space to catch my breath, to rest my tired body and recharge my spirit, to ponder life and my response to life, often with the aid of a good novel or fine film in front of me. It also gives me time to ponder future projects I may one day undertake. Last January, my bathroom remodel was the stuff of wintertime day dreams. I devoted time to study of the space. I took measurements. I made lists of features that I’d like to have in my new bathroom. I considered the ‘before’ and ‘after’ photos of many remodeled bathrooms that appealed to me. I probably overdosed on remodeled bathrooms designed by Sarah Richardson. But only after pondering all of my wishes and restraints for a very long time did I begin to sketch out possible floor plans. It took weeks to come up with one I was ready to develop further, to invest time needed to selecting materials and fixtures. Marble tile for the floor. Ceramic for the tile wainscoting. Shimmery glass mosaics for the upper half of the shower. Calcutta Gold Quartzite for the countertop. A large vessel tub. Pendant lights. Buy why bother with words when I can show you the ‘before’ and ‘after’ so easily with photos? And a few more, for good measure. Most see it as an amazing transformation. But then, how could it be otherwise? It’s always seems to be a step in the right direction wherever light illumines space and whenever narrow views grow to be more opened. What’s true for room design holds true for life in the garden and, most importantly, the life of this gardener, too. Why, even the way I perceive myself has changed. Six years ago, I would never have considered calling myself a gardener, though I did garden a fair amount. So who can say how and when it happened,… I only know that today, I refer to myself as a gardener. And that life as a gardener shapes my view of the world. These inward personal changes cannot be documented with the ease of ‘before’ and ‘after’ photos, though they live within me nevertheless…which reminds me that “To pray is to change.” Like all the other changes that have slowly shaped my present identity, I cannot pinpoint where I first read…and absorbed…these words. I only know that the saying feels true to my experience. My actions shape my prayers and my prayers, in turn, shape my actions… until the two blur to become one… and my prayer becomes my action. In other words, as I often like to say, my life is my prayer. But unlike Douglas V. Steer, I do not know whether I believe that my prayer… or my life… can really tip the cosmic balance (p. 69 of Dimensions of Prayer) of what will occur without either my prayers or my life. But who can say what impact our words or deeds might have on the lives of others? Who can say whether or not that maybe we all tip the balance a little every day? I only know that, today, I’ve settled into sweater weather. And that at certain times in my life, I have felt the warmth of prayers spoken on my behalf as much as I do the warmth of this coral-colored, cotton sweater that, today, covers my arms and heart. Sweater weather! How grateful I am to be within your seasonal embrace. This evening, at some odd but precise moment in time, while many of us go about our regular weekday programing, summer will end with a quick tick-tock of the seasonal clock, and with just the sort of make-believe magic that comes from clicking together two ruby slippers, autumn will arrive to color our world. Fall will inherit fine leftovers to build upon, with the ornamental gardens already lovely and the tomato plants still going strong. Gardens aside and elsewhere in my life, summer leaves behind the reality of a main bathroom that finished prettier than envisioned along with lush memories of a family vacation far better than good planning alone can make. While I could go on about the good happenings that have transpired since spring, with a brief mention of the few sad events that still rob me of sleep, suffice it to say that for reasons unknown, the season feels a little unfinished to me. Alll day long I’ve wrestled with questions: Did I use my time wisely this summer… or would I make different choices knowing what I now know? Did I make enough hay while the sun was shining? Of no matter and with no second chances for do-overs, the final minutes of summer count down, leaving me to wonder which freshly minted summer memory will ultimately rise to the top to define my summer. What will easily come to mind about this summer…oh, say… six short years from now… when I’m a Beatle-ish sixty-four? I pose this question at the risk of knowing how odd this summer has been in ways that have little to do with our milder-than-normal weather. It’s been so unlike the eight summers that have preceded it. Each of those were held together — or shall I say defined and refined — by some overarching theme or activity, making them easy to classify, catalog and recall. Eight years ago, during the Summer of 2006, I had just moved back from Texas, so the big undertaking was getting us settled into our new home. Seven years ago, it was the restoration of our historic home’s long-ignored garage. Six years ago, the landscaping of my smallish backyard. Five years ago, and well-documented in this blog, was one I refer to as “The Summer of Daddy.” Four years ago I helped remodel and refresh my sister’s house. Then, relocating twenty blocks north, I spent the summer three years ago digging gargantuan garden beds surrounding our fifties ranch house. Two years ago I painted the exterior of our house. And this year… this summer, I’ve no major project to show and tell about. With a lull in big summer undertakings, I’ve whiled days away a little here and a little there. 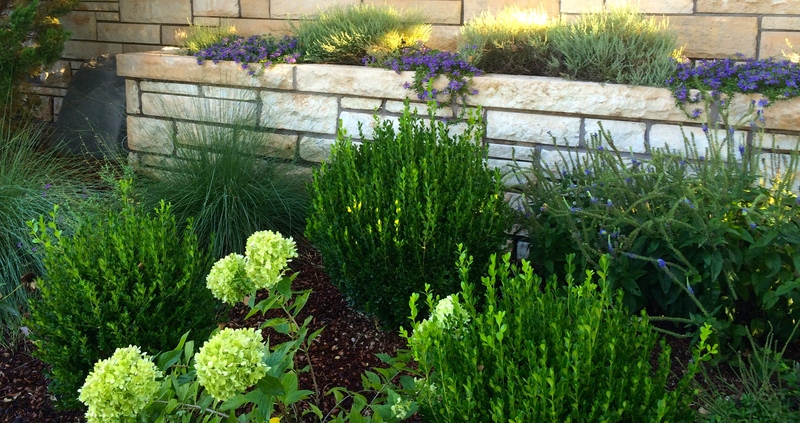 When I wasn’t managing bathroom contractors… or living the good life in Rome and Greece… or entertaining grandchildren or reading books or watching films or performing the daily tasks of everyday life, I devoted myself to the garden. Unless I cheat and count the new fountain garden that my husband helped me add, I made no major changes, but instead spent hours and hours tweaking this and fine-tuning that. First on one activity, that I’ll call weeding. Then picking up another, say, edging, and working awhile… before moving onto another, like triming or deadheading. I’d go out for a few minutes in early morning, telling myself I’ll limit myself to completing one small task. And before I knew it, it was time for lunch. Some days, I came inside well after lunch. At three years of age, I liken my garden to a growing toddler. Though it already hints at the beauty it may one day become, like a young child, it still requires much discipline and attention to keep healthy and in good form. So I give it my time, and in return, my garden teaches me about life. Lessons on beauty and a little something about what I can control and what I cannot. Combine equal portions of roasted corn (cut fresh from the cob), fried okra (cut thin and fried without batter or breading) and fresh tomato in a bowl. Add a dash (or splash) of bsalmic vinegar. Combine and serve. To serve 2, combine 1/3 cup of each vegetable with one Tbsp of vinegar. Can be made an hour or so in advance, adding the vinegar right before serving. Combine following in a bowl with a light toss. Add following ingredients (exdept oil) to a bowl and pulse with immersion blender until well-blended. Add oil and blend again until emulsified.